Torganization – originally started Foundation, perhaps not the ideal envi- lanthropy (with the aim to add more). “A by a trio of Coast Guard veterans who ronment to raise money. Yet the foun- lot of donors, particularly individual do- wanted to give back to their chosen ser- dation, like the group it serves, acted nors, are interested to support the Coast Foundation tackles projects large and vice – which aims to provide support and quickly and surely to shore up its footing Guard in their own communities … the small, and it assists Coast Guard men comfort to the men and women in the and future. Coast Guard, and their families. “We made a strategic decision at that Brengle. 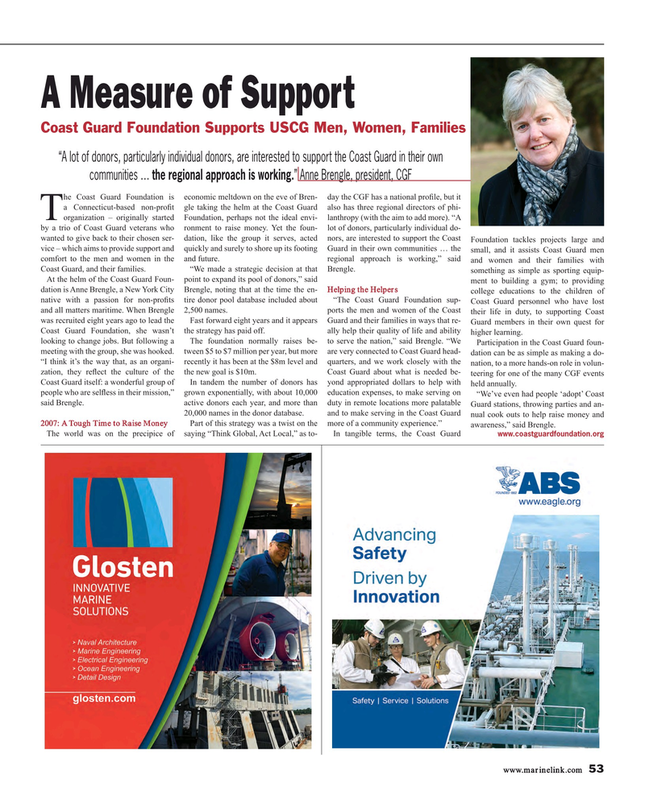 Coast Guard Foundation, she wasn’t the strategy has paid off. ally help their quality of life and ability higher learning. In tandem the number of donors has yond appropriated dollars to help with held annually. people who are sel? ess in their mission,” grown exponentially, with about 10,000 education expenses, to make serving on “We’ve even had people ‘adopt’ Coast said Brengle. active donors each year, and more than duty in remote locations more palatable Guard stations, throwing parties and an- and to make serving in the Coast Guard nual cook outs to help raise money and 20,000 names in the donor database. 2007: A Tough Time to Raise Money Part of this strategy was a twist on the more of a community experience.” awareness,” said Brengle.